For decades many in the American political and policy establishment--including close supporters of President Obama--have looked enviously at the bureaucratic powerhouse of the European Union. In everything from climate change to civil liberties to land use regulation, Europe long has charmed those visionaries, particularly on the left, who wish to remake America in its image. "There is much to be said for being a Denmark or Sweden, even a Great Britain, France or Italy," wrote political scientist Andrew Hacker in his 1971 book The End of the American Era .This refrain has been picked up again more recently by the likes of Washington Post reporter T.R. Reid and economist Jeremy Rifkin. Just last year, international relations scholar Parag Khanna shared his vision of a "shrunken" America lucky to eke out a meager existence between a "triumphant China" and a "retooled Europe." But the tendency to borrow from the European toolbox may be somewhat questionable, particularly given that a growing number of Europeans are either uninterested--barely 40% bothered to vote in E.U. Parliament elections last week--or in open revolt against their own system of government. In the elections, for example, parties generally opposed to expanding E.U. power gained ground in countries as diverse as Hungary, Slovakia and the Netherlands. In Britain, the relatively small U.K. Independence Party, which even opposed membership in the U.N., out-polled the Labour Party and trailed only the Conservatives, who announced their own shift toward a more euro-skeptic point of view. Although the E.U. 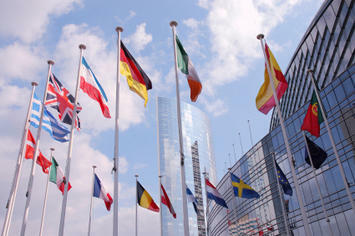 's current top-down bureaucratic approach is clearly losing support, these recent events don't necessarily mean the E.U. is doomed. It's just that people who might be happy to accept a customs union and perhaps even a common currency are simply proving loath to hand over land use controls and environmental standards, much less foreign policy, to Brussels-based bureaucrats. At its root this move represents both a cry against control and a cry for greater autonomy. For the Obama administration, there may be some significant lessons here. Compared with Europeans, Americans are disposed to dislike too much central control. Turning Washington into a new Brussels, with regulations to cover virtually any human activity, could backfire both on the president and his party. But it's also critical not to see Europe's new tilt as affirming Reaganite cowboy capitalism. Many European countries, particularly the northern ones, are justly proud of the "social" models of capitalism they embrace. There are many policies--such as Danish incentives for industrial firms to greenify themselves, efficient universal health care and tough fuel economy standards for cars--that should be discussed and perhaps even adopted in some form in the U.S. In one sense, we should understand that Europeans are trying to protect their preferred standards when it comes to culture, social structure and lifestyle. They remain, if you will, fundamentally conservative in their efforts to preserve their well-established welfare states. But overall the anti-E.U. vote should make it clear that Europe's overall economic system makes for a poor role model for our country. When the current economic crisis first hit, many European leaders--and their American fans, like Harvard economist Ken Rogoff--saw vindication for the E.U. 's economic policy and a much tougher road for the U.S. over the next year or two. Yet in reality, Europe already has suffered as much as we have from the downturn, and recovery there may also be even slower to emerge. In some countries, such as Greece and France, social unrest has been far more evident than here in the U.S. Simply put, European models do not necessarily work better--and when they do, they have occurred in part due to shifts away from strict welfare-state policies. As Sweden's Nima Sanandaji and Robert Gindehag have argued the recent return to growth in places like Sweden came only after some modest reforms in both taxes and social benefits. Yet at the same time, even successful European countries--as well as the whole E.U.--generally experience slower growth than the U.S. with respect to measures like gross domestic product and job growth. This makes it an example of limited utility for America, a country that needs strong economic growth in order to maintain both its quality of life and overall social sustainability. The biggest source of divergence between the U.S. and the E.U. lies in demographic trends. For the most part, Europe is aging far more rapidly, and its workforce is shrinking. As demographer Ali Modarres notes, America's population over the second half of the 20th century grew by 130 million, essentially doubling, while the populations of France, Germany and Britain together increased by 40 million, or 25%. As a result, there is virtually no European equivalent for cities like Houston, Phoenix, Las Vegas or Atlanta. American cities sprawl--and will likely continue to do so--because they are newer and because they are growing much faster in a country that is much vaster. Even with 100 million more people, the country will still be one-sixth as crowded as Germany. These differences will only become more stark. Opposition to immigration--from both Muslim countries and the E.U. 's own eastern periphery--is growing even in historically tolerant places like Great Britain, Denmark and Holland. Over time, migration into Europe is destined to slow. In Barack Obama's wildly multicultural America, strong restrictionist sentiments have not gained much political ground, and, at most, efforts are directed not at reducing legal immigration but rather shifting it toward a more meritocratic model. So we can expect America's population to continue growing at close to the highest rate in the advanced industrial world while Europe remains among the most rapidly aging places on earth. America's fertility rate is 50% higher than Russia's, Germany's and Italy's. By 2040, for example, the U.S. could have a greater population than the first 15 member nations of the European Union. Compare that prediction to 1950, when America had only half the population of Western Europe. These numbers point toward separate destinies for the U.S. and the E.U. Throughout history, low fertility and societal and economic decline have been inextricably linked, affecting such once-vibrant civilizations as ancient Rome, 17th-century Venice and, now, contemporary Europe.The desire to have children also reflects a fundamental affirmation of faith in the future and in values that transcend the individual. This is particularly true in affluent societies, where it is socially acceptable to remain childless and technology has made the decision not to have children easier to enforce. The U.S.' demographic vitality will allow it to emerge from the current economic doldrums with more rapid growth than Europe--continuing a trend that has generally held for most of the past two decades. Innovation, largely a product of youthful indiscretion, also will continue to emerge more quickly stateside. Indeed, according to one recent European Commission survey, at the current rate of innovation, it would take 50 years for the E.U. to catch up to the U.S. Largely thanks to these demographic pressures, we could see an American economy twice the size of the E.U. 's by 2050. Unlike Europe, we have better prospects for growth, since there's really no sustainable alternative for our society. In contrast, 40 years from now Europe's economic growth rate is expected to fall 40%, due directly to the shrinking size of both its labor force and its internal market. We can ultimately expect two very different courses to develop. In America, the emphasis needs to be on sustained growth to prevent a massive decline in living standards. In contrast, Europe may be able to maintain a steady level of prosperity--even with lower growth, since its population will be either stagnant or declining--at least until the looming costs of maintaining a welfare state impose onerous economic burdens. Neither Europe nor America--particularly given a much-reduced E.U. bureaucracy--has a better or worse model. We just have to recognize that these are, in the end, increasingly different societies: The former is focused on preservation of its hard-won peace and prosperity; the latter is challenged more by constant, major and sometimes even frightening change. Some may still hold out the hope that wise men in the old continent will present us with a road map to the future. But given the revolt going on against this mega-European ideal, we should understand that even many across the pond are having second thoughts about a future controlled by Brussels. Perhaps it's better to recognize that most solutions to America's problems--now and in the future--will be concocted not in Brussels, Berlin or Paris, but at home. Joel Kotkin is executive editor of NewGeography.com and is a presidential fellow in urban futures at Chapman University. He is author of The City: A Global History . His next book, The Next Hundred Million: America in 2050, will be published by Penguin early next year.